Increasingly complex software licensing models, a fastchanging IT landscape and heightened risk of vendor-driven software audits are making software license and asset management a top-of-mind issue for IT and business organizations alike. From heightened expectations about the efficacy of SAM tools to a lack of understanding of audit risks, organizations too often fall prey to complacency. 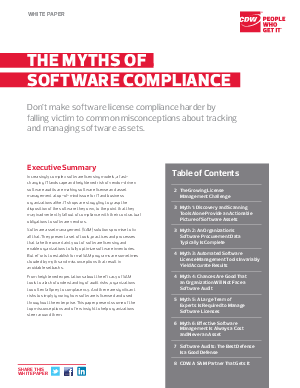 And there are significant risks to simply ignoring how software is licensed and used throughout the enterprise. This paper presents some of the top misconceptions and offers insight to help organizations steer around them.